Seen anyone rummaging through your company's skip recently? Perhaps they're artists from Sheffield's digital arts group Redundant Technology Initiative. Emerging from a unique collaborative recycling campaign, The Bracknell Gallery presents an extraordinary opportunity to see hundreds of discarded computers transformed into high-tech art. "We wanted to be creative with technology, but we simply didn't have the money to buy computers." says RTI's co-ordinator James Wallbank. "When we found out that more than a million computers get scrapped every year in the UK we looked in the trash, and found all the technology that we needed!" "We've been exhibiting for a couple of years now, and since our early skip-raiding exploits, we've started to go legit. Now we run a publicity campaign asking companies to donate their high-tech junk and they have been more than happy to donate it to us. We recover and refurbish the old machines, then use them as tools and material to make artworks. We can even access the internet using zero-cost trash technology, so now we publicise what we do on-line as well." "We're delighted to be showing in Bracknell. At the heart of Britain's technology belt, what we are doing is particularly relevant to this area. We have had a fantastic response from businesses and organisations around South Hill Park. So is it art or is it activism? "It's both! Throughout history artists have been concerned with what is going on in society, but recently that aspect of art seems to have taken a back seat. We think it's about time that artists started speaking out again. In our opinion that's the only way that art can renew its relevance to everyone outside the art world." The exhibition at Bracknell brings up issues of built-in disposability and accelerated redundancy in our high-speed culture, and it changes our perceptions of technology. Computers are presented not as shiny, expensive consumer products but as battered metal and plastic boxes, scuffed and stained from years of use. The artworks strip away our exaggerated respect for the digital so that we can all get involved with it in a no-nonsense, practical way. In the centre of Britain's Silicon VaIley, Bracknell Art Gallery presents an exhibition which gently satirises our obsession with the technological age. Sheffield based arts group Redundant Technology Initiative have transformed hundreds of discarded computers into art. 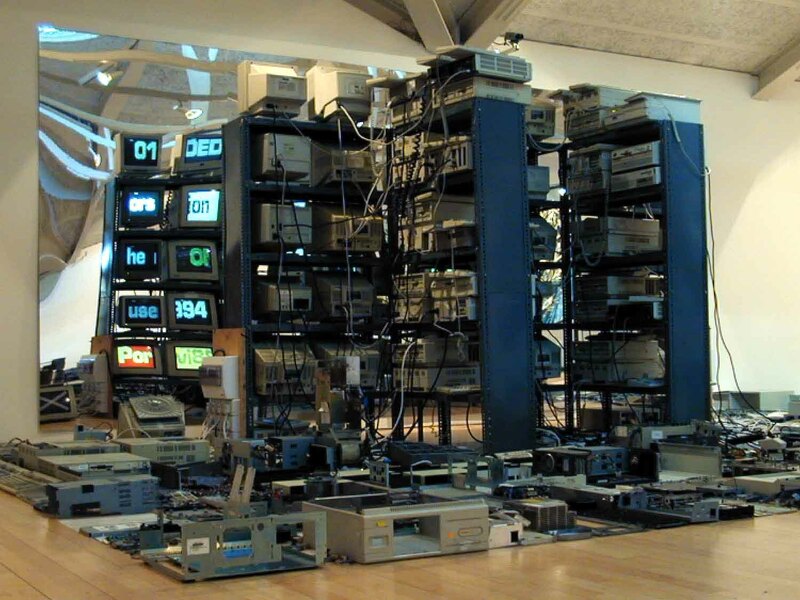 Exciting and innovative visual art has been created from old technology, recycling computers, printers and software into sculptural environments which include computer generated graphics and programmed activity. Computers are presented in an unfamiliar way, not as shiny, expensive consumer products but as battered metal and plastic boxes, scuffed and stained from years of use. The installatons present computer technology in various stages of decay, from the fully functional to the burnt out box. The artworks aim to question our obsession with high technology. The exhibition deals with issues surrounding the explosive growth of information technology, accelerated redundancy and environmental issues surrounding the disposal of computers. The works raise questions about the future of computers, about disposing of redundant machines whilst presenting their own artistic solutions. Redundant Technology Initiative wanted to be creative with computer technology but did not have the money to buy new computers. On discovering that more than one million redundant computers get scrapped every year in the UK, the artists and Bracknell Gallery ran a recycling campaign earlier this year asking for computers to be donated for the exhibition. This was met with a fantastic response from individuals and companies around South Hill Park, who have donated machines for the show. A bank of working computers have been formed into a low technology video wall. Unlike most video walls it faces away from the viewer exposing the tangle ot wires and cables that power the setup. We can peer through the piece to see the output of the screens on a mirror behind it. Text scrolls across the screens: fragments of news items, technical data and internet clips. Four glazed panels containing crushed and granulated computers are suspended in the gallery. Like sections of a futureworld geology, the layers of discarded technology draw attention to our thoughtless disposal of these expensive machines. Ten steel panels rusted and decaying reveal a mysterious alphabetical list. When the piece was first exhibited in 1995 the steel sheets were bright and rust free. The audience were invited to spray the panels with corrosive liquids. Since then, text has appeared and is now disappearing into rust. Redundant computers and spare parts given to RTI during the course of tne project are transformed into a technological cityscape across the gallery floor. After the show the machines will be refurbished by RTI for future projects. The volunteers who helped collect donated computers. And thanks to the generous individuals too numerous to mention who donated equipment to our appeal. Read about the organisations and business that have donated computers to our appeal here. Next Update: Very Soon! More images of the show and follow-ups on donated machines.